Now and then I see things on our travels that strike me funny (or weird or out of place) and I have to take a picture. These things don't fit neatly into any category but over the years they've become a category of their own. I suppose some would call them public art; just as many might call them public defacement. I like to think of them as philosophy for the masses. One of the first to catch my eye on a walk through my neighborhood, this one had me smiling all the way home. Scratched into a new section of sidewalk, it seemed simultaneously deep and silly. What does it mean? Should I feel sorry for pancakes? Or maybe envious? Pancakes don't have to worry about breaking a hip in their old age, do they? 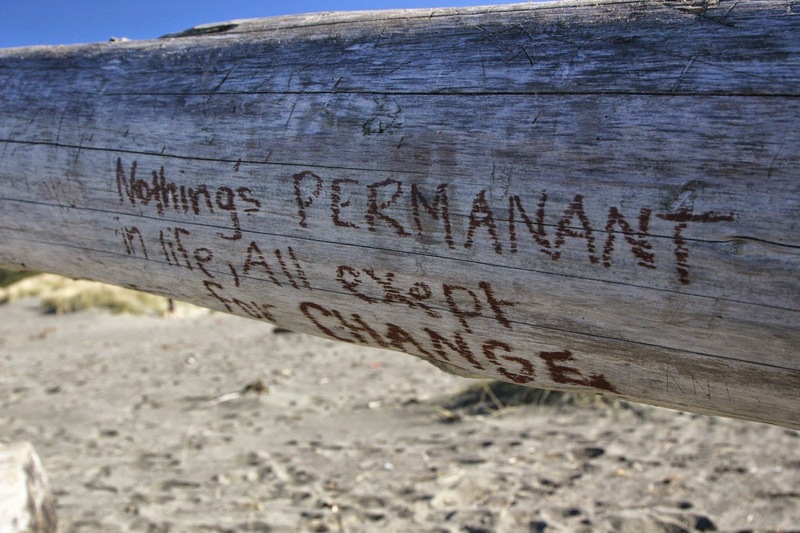 Written on a large piece of driftwood, I found this one on Salmon Creek beach in Sonoma County, CA. 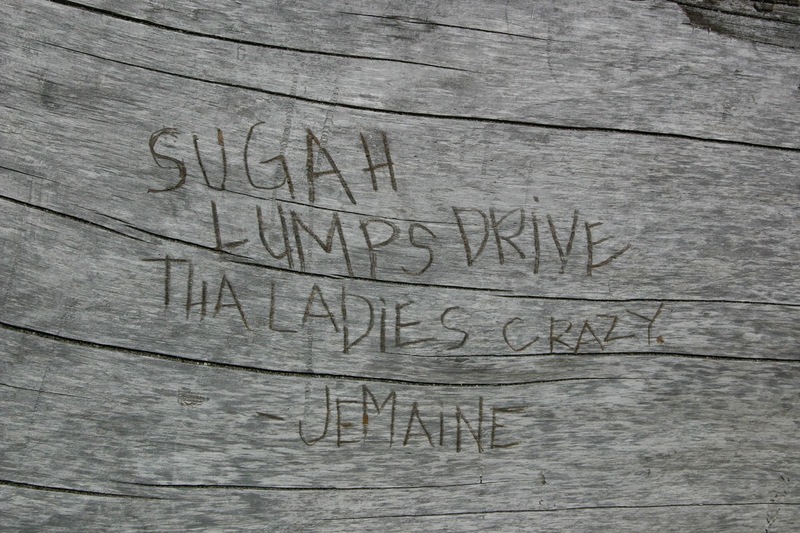 Perhaps nothing is quite as permanent as misspelled words in a public place. Taken from an MGMT song "The Handshake," this one was a bit disturbing. 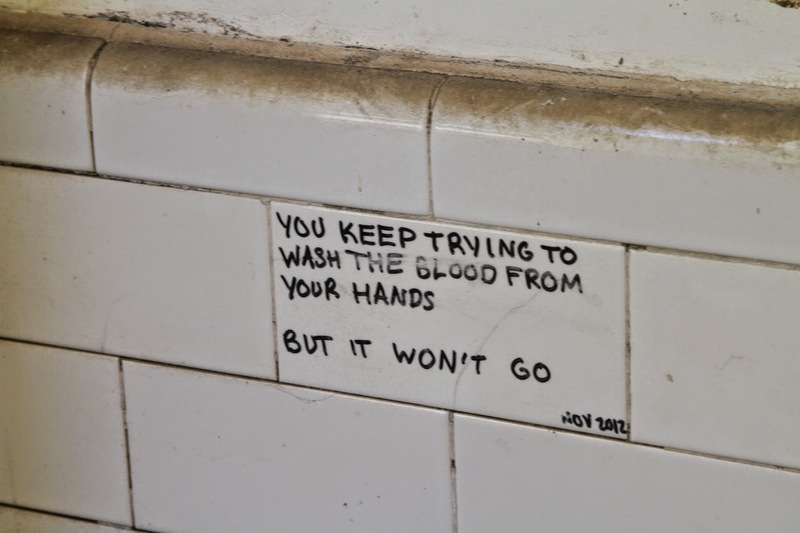 It was written on a tile wall in an old military hospital on Angel Island in the San Francisco bay. The place has a haunted feel; the wind echoes through the broken windows and almost sounds like ghostly patients moaning in pain. Kind of gave me the heebie jeebies. Speaking of song lyrics, this line from a song by Flight of the Conchords made me laugh. The Conchords make me laugh anyway, but picturing a 20-something guy laying on the sand scratching this into the driftwood after a few beers while his drunk friends cheered him on was too much. How did I know he and his friends were drunk? The remnants of the 24 pack of beer that surrounded the site, sprawled in the sand like drunken sailors passed out on shore leave. This was scratched into the sandstone wall in a slot canyon in the Vermillion Cliffs National Monument on the Utah/Arizona border. 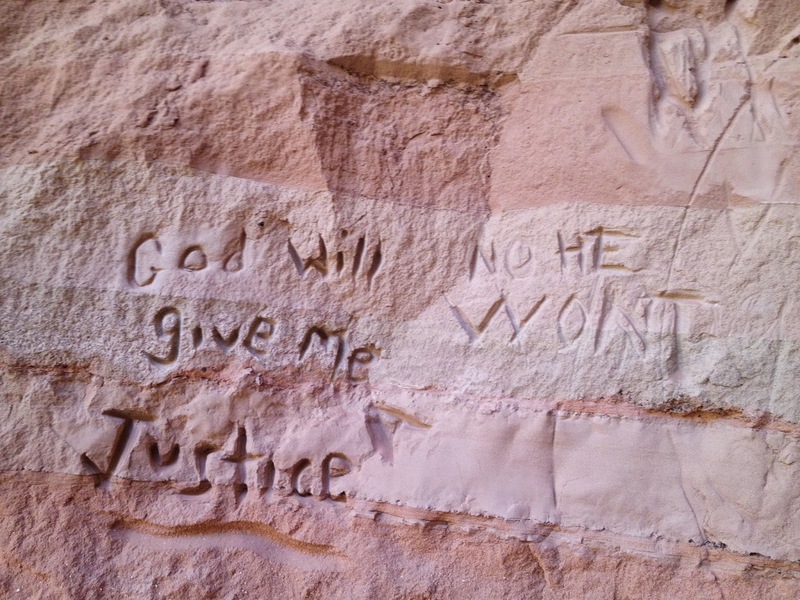 I wondered if the first "artist" was a bit more committed to his message; "God will give me Justice" must have taken a lot more effort to etch that deeply into the stone. Then again, the second guy has a point: anyone who would spend that much time defacing a national monument might not want justice to come his way. Spray painted using a stencil, this one popped up on several walls in Venice Italy. 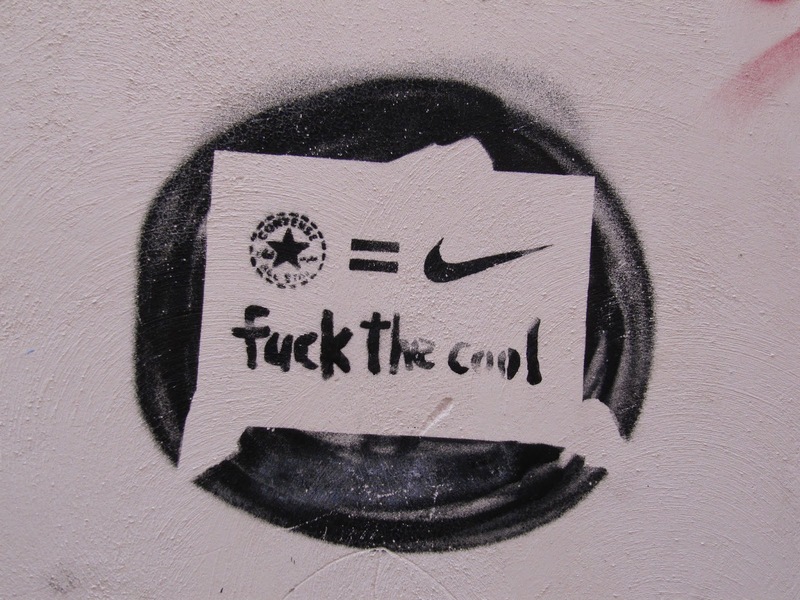 Not sure if it was anti-corporate, anti-American, anti-sweatshop, or anti-fashion. Pretty sure it's anti-something though. 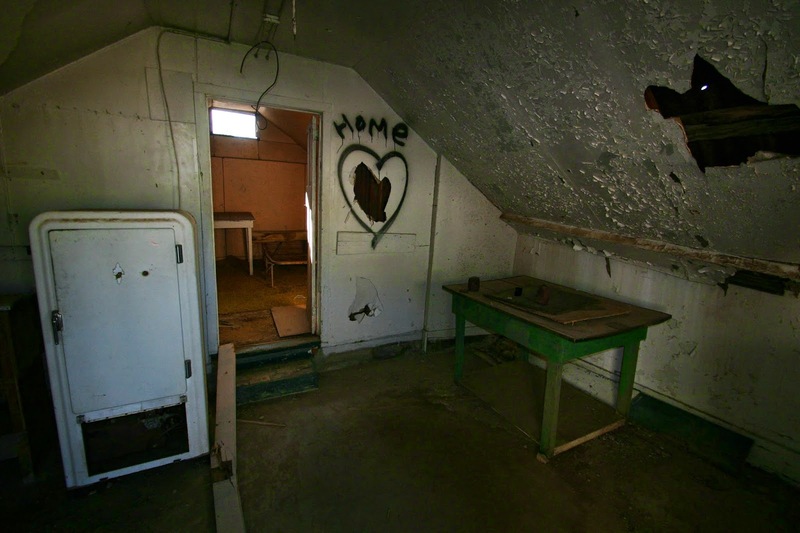 Inside an old miner's cabin in Death Valley National Park, I found this one to be rather sweet. A heart-shaped hole in the wall was accented with this little bit of graffiti. If home is where the heart is, they found it in the kitchen. Along with the bullet ridden refrigerator. Is Italy the place for lovers? Apparently so. 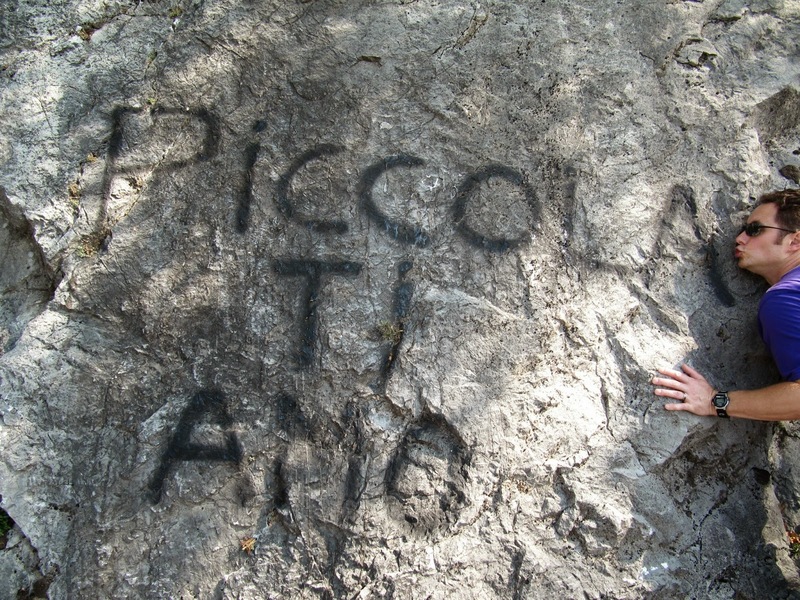 This was spray painted on a roadside cliff in the Tuscan countryside near Magnano Italy. Mark helpfully translates the message for us: "I love you." Do you have any examples of public philosophy? I'd love to see them! Write them up in the comments section, email me at runningfrommoose@gmail.com and attach a photo, or post them on my Facebook page here.